My new project which has been in the works for around 2-3 months is officially done so I thought ide share. Ive really loved the emersed/submerged planted tank look for a while now and also the paludarium tanks people do so I thought ide do a combo of a few ideas ive seen in a mini version. I got a set of glass bowls from Ikea and set aside the large 3lt for this project. I also found a mini submersible filter on eBay which ive modified a bit to make it even more compact. The hardscape is built from 7 stones I found during my lunch break jogs/runs at work which I complemented with a nice piece of gold vine I picked up from the LFS. Was hard to cut up the wood but it was worth it. 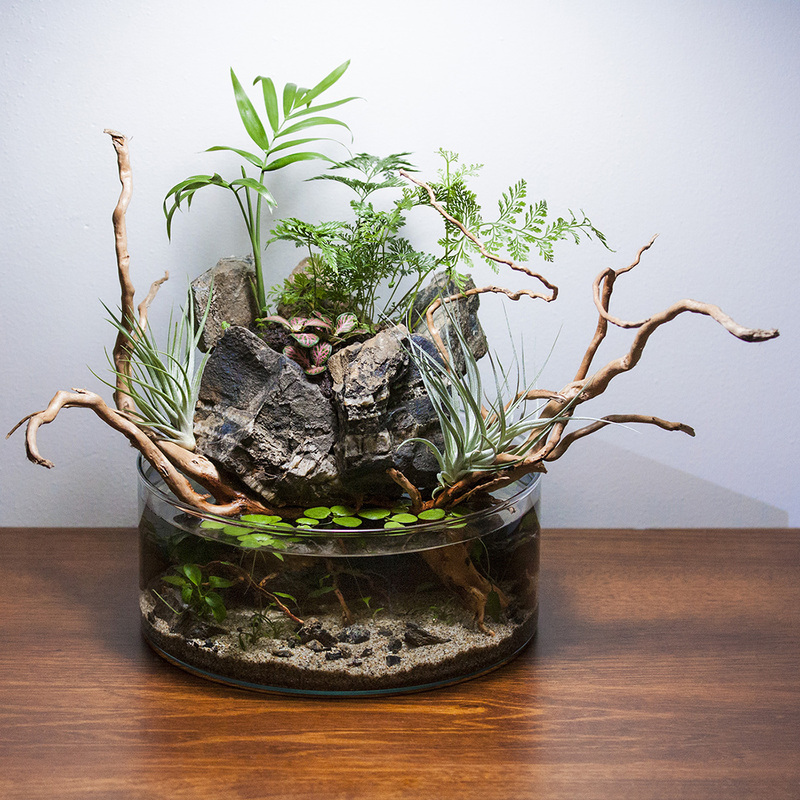 As I built the hardscape I did countless test fits in the the glass bowl being super careful not to smash it and ensure the pump would fit and not be seen... Finally I got the stone work nailed and finalised the jigsaw puzzle with the gold vine. Picked up the last plants today so there was nothing stopping me from pulling the trigger and finishing off the build. More pics of the hardscape are on my Instagram where ill be also putting up some stuff from my other tanks. Ill add some more piccies of this tomorrow if anyone's interested. Will be putting some xmas moss in here soon along with some shrimp and possibly some snails when the system has stabalised. The aquasoil and base mineral is capped with Pisces Sahara Gold sand so im hoping that cycling wont be too bad with this setup. Last edited by FishyFellow; 30-12-18 at 10:31 PM. 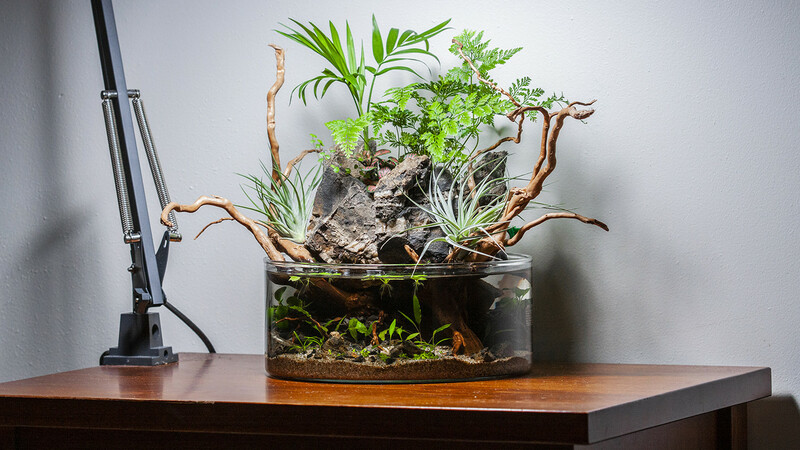 Do you have a waterfall setup with the filter? I can't really see it clearly. 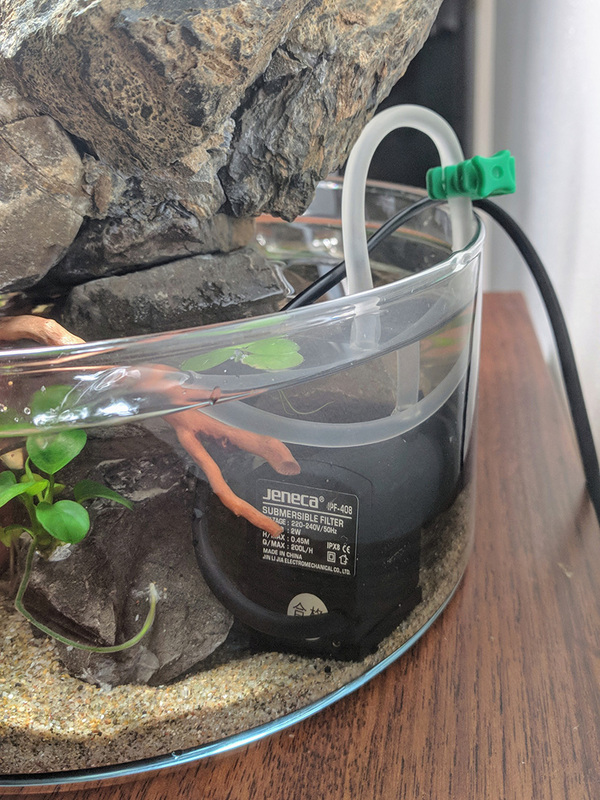 This setup might be a too small for shrimp although might be ok if you are good at keeping temperature stable and top off evaporation daily. Thanks Rebel, Im more than happy with the outcome. 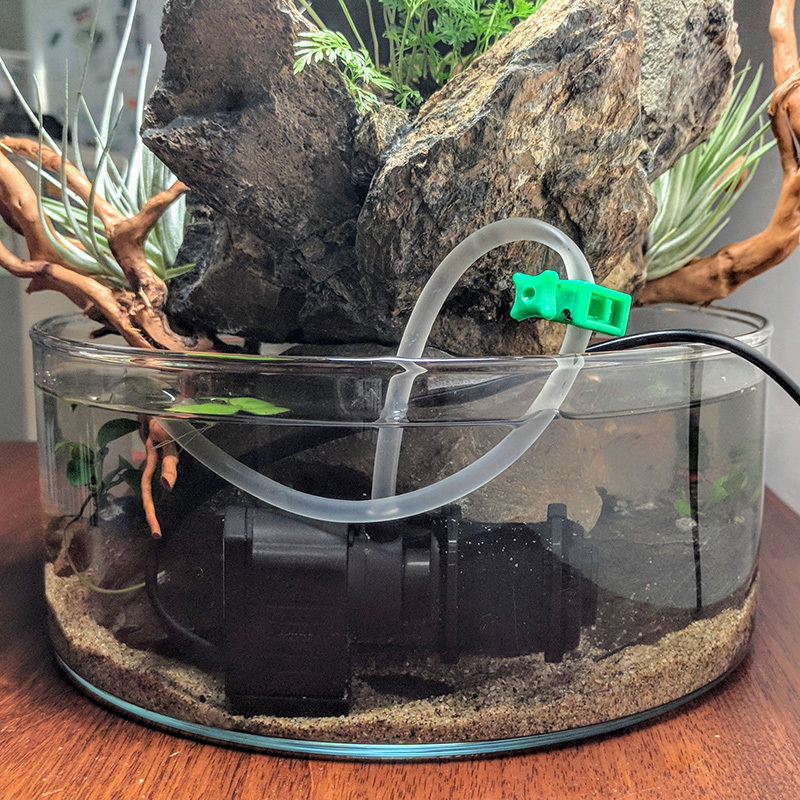 I have left enough line from the pump to run it into the rock plant bowl but decided to just have it in the water column for now as I don't want to make a mess with the run off back into the water. 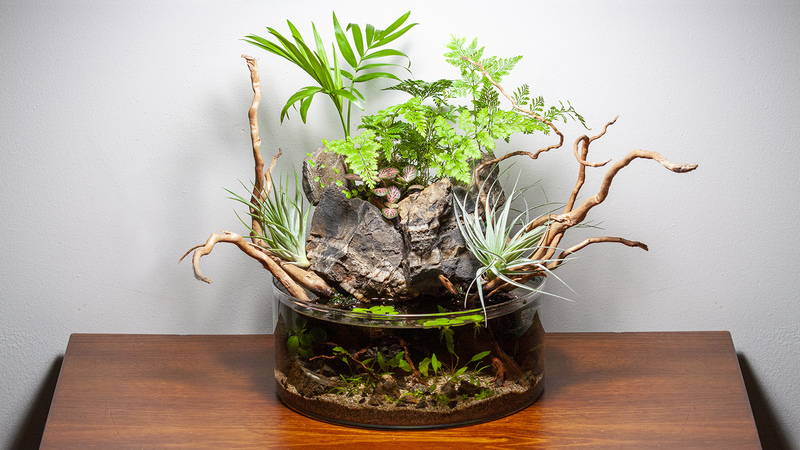 The rock bowl has 1-2 drain holes thru to the back, I thought about a waterfall when designing it but the plants ive used wouldn't like being so heavily saturated. 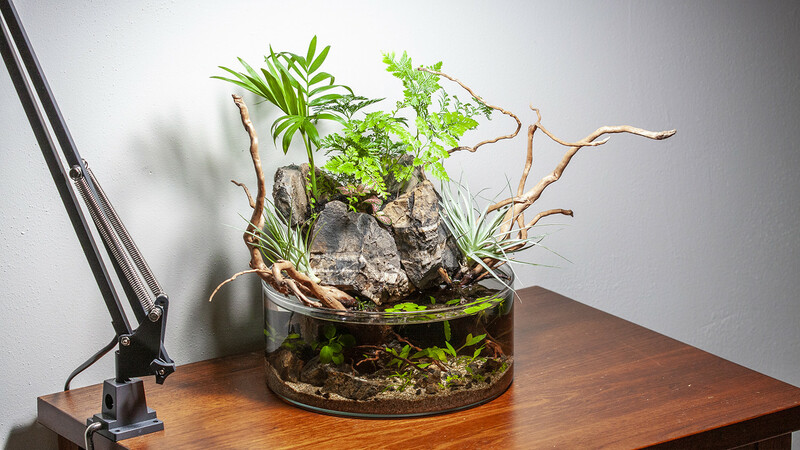 The rock bowl has a mix of aquasoil, base mineral and peat. I plan on using the line for watering or just spraying, will see what works best. Side view, 90 degrees from front on. Rear view. You can see the extra line length here, it fits into on of the V's in the rock bowl nicely. I had to tap it as the flow was pretty strong. Not exactly a bad problem to have. I think you might be right. Temp would be the biggest issue, ill have to monitor it so I know what it sits at before introducing anything. My wife is home every day as she looks after our kids so when its hot the air conditioner is on but this might be best suited to some snails as a clean up crew and just keep their population in check via removal. Maybe a few glass shrimp. The handle inappropriate temps quite well. Glass shrimp are a good idea. I found out yesterday that The Cinescaper has red cherries in his similar scaped bowl without issue. I was thinking I could pop out the filters mini cartridge and trim the coarse sponge a little to make room for some crushed bio noodles from one of my cycled tanks to give it some bio filtration scope. After this has been running for a few weeks I just might give 3-4 cherries from one of my other tanks a go and see what happens. Looks so good, I think cherries will probably do ok in there, specially if you can add some of the bio noodles. Following your instragram, would love to do something like this one day! Few weeks back this setup turned 1 month old. These piccies were taken at that time so I could compare growth. Super happy with this setup. I have no livestock in it still, had a snail in it when I went away for a week and he caused such a mess I removed him and it took about a week to get ontop of the water quality so I haven't bothered. Some shrimp would be nice but im not too fussed. 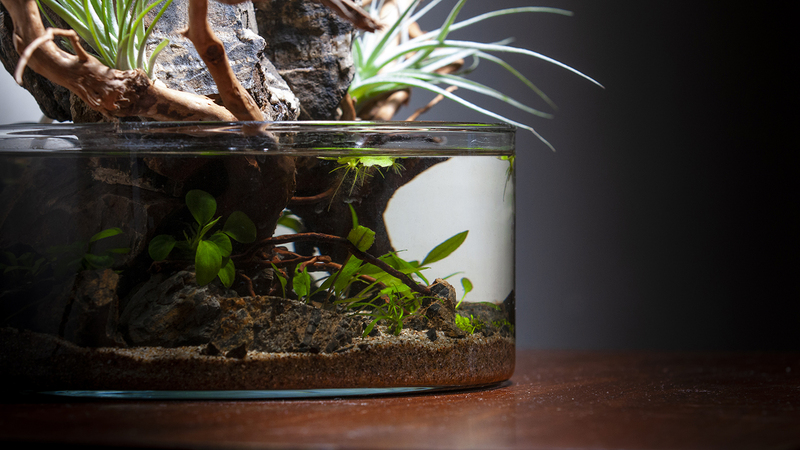 It can be a pretty high maintenance/finicky setup with the aquatic plants without the need to complicate it more lol. Only real change to this is I finally found a Tillandsia - Ionantha 'Mexico’ air plant at Bunnings yesterday so swapped out the one on the right for this and added some small pieces of Monte Carlo to the foreground from my trimmings in my other tank to see how they will fair. Last edited by FishyFellow; 21-02-19 at 02:19 PM.